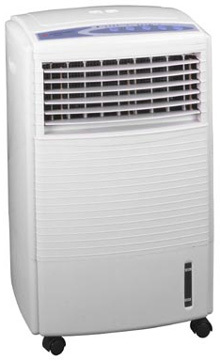 Perfect for areas that central air conditioners can't reach, or for an area that has a high sun load.Unlike a regular fan. that blows hot air, our air coolers utilize ice and water to cool the ambient temperature up to 12°F. This versatile and economical Evaporative Air Cooler utilizes oscillating louvers to evenly distribute refreshing chilled air through out the desired space. Also functioning as a humidifier, the SF 608R chills your room up to 12°F cooler than the ambient temperature and the lightweight, mobile design makes it easy to roll to anyplace in your house or office. Copyright © 2003-2013 Thermospace Inc.